To most people, staying healthy is an important goal. We feel better when we exercise, eat right and take steps to maintain health and fitness. Did you know the hot tub can help promote healthy habits? Here’s how to use the hot tub for health. With age, regular exercise can become difficult, even painful. A hot tub at home makes it easy to get in a few minutes of cardio without pressure on joints or muscles. Water is buoyant, meaning you can exercise comfortably in a cushioned environment. Slipping into the heated water of a hot tub after a long day is the key to vitality and youth. With targeted massage to ease pain and stiffness, a few minutes each day is enough to erase stress from body and mind for a healthier, happier you. For working families with children, it’s next to impossible to find time for everyone to come together. Schedule a dip in the hot tub and make it a priority. The relaxed, distraction free environment is good for the soul, and a smart way to reconnect with loved ones. 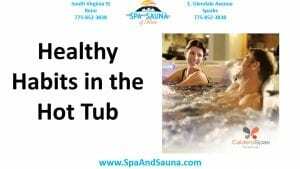 To learn more about the benefits of owning a hot tub, just give us a call at 775-852-3838 or visit our website at: https://spaandsauna.com.